streams of water in a full circle pattern. Easily directs water exactly where you need it in a wide variety of planting areas. Working pressure range: 1.1-8.8 lb. 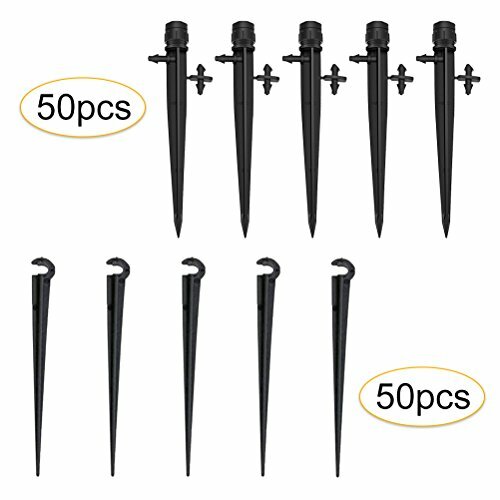 Package Contents:50pcs Drip Irrigation System and 50pcs Drip Irrigation Support Post for 4 mm / 7 mm Drip Irrigation Tube. Water Exit: Total length: 5.2in / 13cm; Outlet diameter: 0.05 inch / 14mm. Irrigation Angle: 360 degrees for 4/7mm (inside/outside diameter) pipe. Each drop has 8 outlet holes at the top. Water Flows Control: water flow can be regulated by rotating the outlet covers. Adjust the amount of water you use according to your actual need to keep your plants growing healthily. Use Steps: 1. Connect to PE pipe directly. 2. Connect to 4/7 distribution tube. Tip: soften the hole with hot water before connecting the tube to the drop head. Wide Application: Suitable for pots, tubs, ground cover, landscaped gardens, flower beds, vegetable gardens, herbs gardens, greenhouse, orchard, lawn, self plant etc.